Amazon Echo 1st gen review | What Hi-Fi? Update: There is now a new Amazon Echo. You can read our hands-on review of the new Echo and Echo Plus here. Below is our review of the 1st-generation Amazon Echo, originally published November 1st 2016. The Amazon Echo is much more than a wireless speaker. In fact, playing music is something of a sideline. The core aspect of this device is the Amazon Alexa voice-assistant – and Amazon’s desire to get it into your home. Alexa is designed to answer your every beck and call. Whether it’s providing information such as the latest news and weather, adjusting your heating, or controlling your AV system, Amazon’s Echo speaker promises to do it all. After launching in the US last year, the Echo is now available in the UK and Germany. But does it deliver on its “computer in the cloud” promise? And is it any good as a wireless speaker? 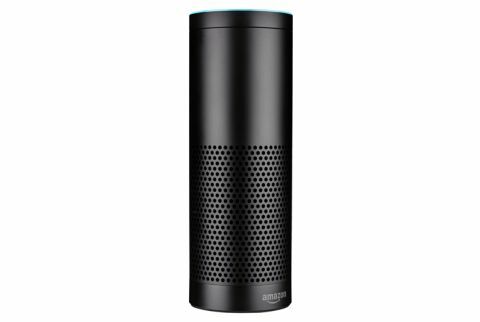 The Amazon Echo is an upright, cylindrical speaker, available in black or white finishes, and while not exactly screaming high-end desirability, it is easy enough on the eye to merit a place in the average home. And it feels solidly built for a £150 wireless speaker. Inside are seven microphones, alongside a plethora of voice technology to make sure your commands are heard and also allow multiple speakers to work out which is nearer to you. Also inside is dual-band, dual-antenna wi-fi, Bluetooth, and two speaker drivers, a 6cm woofer and a 5cm tweeter. Amazon is keen to emphasise that this is a “great speaker” as well as a clever personal assistant, and it also promises 360-degree sound to give you plenty of flexibility in terms of placement. On top of the device you’ll find the 'volume ring' as well as the mute and action buttons. LED lights around the ring will show you when Alexa is listening, though you can mute the assistant entirely. Getting started is simple. Plug in the speaker, download the Alexa app, and you can be barking commands seconds later. Once up and running, it’s all about your voice. But you do have the option of adjusting the volume on the Echo itself, while opening up the Alexa app will also give you some more control options. There’s also an optional Amazon Voice Remote for £20. 'Alexa' is the 'wake word', after which you can ask the speaker to play or pause music, read the news, weather, football scores, and so on. Both the success of these voice commands and the number of available services is crucial. Alexa is learning all the time and Amazon is aiming to add new partners at an equally rapid rate. Providing you speak clearly and use the recommended phrasing, Alexa is pretty impressive. A change in the tone of voice can confuse it, and while the Echo doesn’t get every artist we request, it has a fairly good strike rate. Amazon makes a great play of how well Echo can hear its name, even in busy rooms or when there are multiple devices. We don’t have an issue with Alexa hearing us – in fact, we are more concerned with trying to talk about her, which proved difficult without causing a flash of light on the speaker. But it’s not just about the music – Alexa has many ‘skills’, enabled through partnerships with content providers, including Crestron, Uber, Sky Sports, The Guardian, Telegraph, National Rail, EDF Energy and Jamie Oliver. Getting location-based news and weather updates is easy enough, while some other skills require simple linking of accounts. Add your Uber account and you can ask Alexa to find a cab. A notification will arrive on your Uber app to confirm it’s on the way. For some apps, the lack of a screen on the Echo means it may just be simpler to use your phone app. However, the more compatible products you have, the more you will get out of Alexa, so it’s down to Amazon to keep adding ‘skills’ and partners. Alexa’s other skill is connecting and controlling hardware, with Amazon aiming to give you complete control of your ‘smart home’. We’re talking lights, switches and thermostats. Commanding the lights to turn on as you walk in the door is no longer the preserve of the rich and famous. It really works. On the AV side, custom installers already have Crestron support, allowing you to add voice control to a complete home cinema system. Sonos and Amazon have also announced a deal to bring Alexa voice control to Sonos gear. We look forward to seeing more AV brands getting involved. We should also mention the Amazon Echo Dot, a puck-sized unit that’s designed to be connected to existing speakers, systems or even headphones. The Echo Dot has the same Alexa voice assistant and skills, and looks like the top of an Echo speaker, complete with control buttons and volume ring - plus added volume up and down buttons. It also has the seven microphones inside, as on the Echo, so it can hear all your commands. There are small speakers, so you can hear Alexa, but for music playback the aim is to connect to an existing system. It has a 3.5mm stereo audio output for this purpose, as well as wireless Bluetooth connectivity. The Amazon Echo Dot could prove to be a clever addition to an array of existing audio and video products that would benefit from its voice control (as well as all the other features). We’re looking at you, Sonos. If you want the voice-controlled music experience, then you will need to use Amazon Prime Music, Spotify or TuneIn radio. You can stream music from any source – as you would a standard Bluetooth speaker – but other apps won’t have voice control function. Amazon wants to integrate Alexa with more devices, but for now Amazon Music is the default service, though that can be changed to Spotify. Whichever service you use, you can see the track playing on the Alexa app. You can also ask Alexa what track is playing and other voice commands include playing by song, artist, genre or even playlist, and pause, shuffle and volume controls. The success rate isn’t quite 100 per cent – lesser-known bands with strange names may take a few attempts, but we had no issues getting commands to work from a reasonable distance. But the Echo’s sound quality is a different story. Listening to music via Spotify, the Echo speaker plays it safe at both ends of the sonic spectrum. You avoid any unwanted harshness in the treble, but you don’t get a whole lot of bass depth either. The speaker goes reasonably loud, but turn it up too high and you’re more likely to get the speaker itself shaking than any room-shaking bass. Overall, it fails to match its rival wireless speakers, from the similarly-priced Monitor Audio Airstream S150 to the multi-room capable Sonos Play:1. Compared to the class-leading mains-powered speakers, there’s a fair gap in sound performance too. The Echo is perfectly listenable, but for more discerning listeners, you can get a whole lot more detail, definition and dynamics from something like the Monitor Audio S150. Listen to Gangstarr’s Full Clip and the track sounds lightweight, lacking the energy and punch you’d get from a better speaker, the bass notes really not measuring up. Acoustic numbers, such as Bank’s To The Hilt, fare a little better, with vocals sounding clear and open, but similarly priced speakers offer a more engaging listen by delivering a fuller sound with greater insight. Of course, the Echo is much more than just a wireless speaker. If you simply want a Bluetooth speaker to listen to music, you should probably look elsewhere. But by adding voice control to the equation, and bringing some futuristic functionality into play, the Echo is a satisfyingly clever little speaker. The Echo demonstrates that Alexa is a slick, useful voice assistant, and one that should improve over time. And while Alexa isn’t the only one – Apple’s Siri and Google’s Assistant spring to mind – it’s currently most likely to make a real impact throughout your home, and not just on your phone. The more compatible apps, and devices you own, the more you will get out of the Echo. So we look forward to seeing more AV brands offering Alexa support. If they do, the £50 Echo Dot, with its wired or wireless connection to existing speakers and systems, could yet prove an option for many people. MORE: Amazon Echo vs Google Home: which is better?